It was followed by an emoticon denoting sadness. I sat up, partly due to disbelief. Illogical disbelief. Gabriel Garcia Marquez was 87-years-old. He was sick and frail. Reports of Alzheimer’s pointed in the direction that the beautiful mind that had given us works that pulled us through our years of solitude had exhausted its reservoir of memories. He had done his job. He had given enough to this world. It was his time to go. Yet, a strange sense of loss hung in the air. “He introduced me to the wonders of literature, of the world he wrote about. No one has written quite like him… (experiencing) a sense of loss.” wrote Shai to me. And I knew what she was saying, exactly. “But nobody can write like him, right?” I retorted. Tooba and others like her must have had the liberty of revisiting just the right Marquez works when things happened as they grew along in life. I did not. Even now, I do not know his works as well as I should. I cannot talk about his work or quote him from memory, but I know enough to feel his books etched on me. I know some of the nuances will dawn on me after I have read his books more than twice, have dog-eared them, have marked the quotes I love best, have left my fingerprints on them. Not via Sparknotes or Goodreads quotes, but the real books. And I must. How can I not read and re-read the man who managed to see magic in the mundane? Living in a world where one is compounded by pragmatics; where even dreams are calculated; where the mundane threatens to take away remnants of creativity and desire, Marquez helps us fantasise but within the framework of the real and the physical. His world is the world I want to live in while I live in my actual world. He has given me and so many of us a doable way out. Like the clouds of yellow butterflies heralding the arrival of a lover as Shai reminded me today. It may be that cultures that have disconnected with mythology will have a hard time understanding Marquez. To me and others from cultures like mine, I believe understanding his work comes naturally. So one inspiration for a distant dream of learning Spanish is that maybe one day I can read his original words. Marquez is an inspiration of sorts. He was a journalist yet, he produced these fantastical works. When cynics try to tell me that day after day churning out uncreative journalistic reports and editing them will rob me of chances of ever writing fiction, I will remember Marquez and silently ignore those cynics. He also inspires me in his relationship to Mercedes, his wife of 50 plus years. They give me hope. With a man of his mind, it must not have been an easy ride. But Marquez makes me believe that relationships of creative people can be magical yet real. They can be sustained. And one day, just maybe, one day, if I go searching for ancestral roots both in Jalandhar, India and Khairpur, Sindh I will be carrying a copy of One Hundred Years of Solitude in my hand while I dig into my family tree. Timelines of friends, even unexpected ones, are filled with sad updates about Marquez. Some have used the word ‘mourning’ for what they are experiencing. But his life needs to be celebrated. And it will. As it always happens, sales of his books will go up. People who have never read him will talk about him. And that is a good thing. For whether you read him or not, you already know him, because he essentially wrote about love, the truest kind. 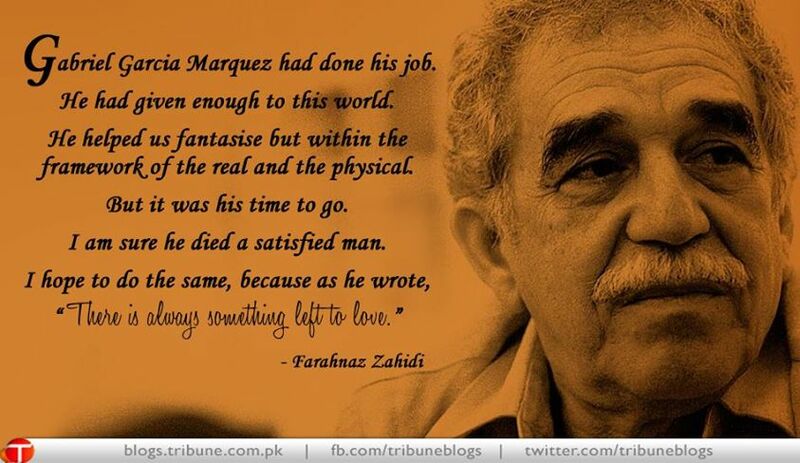 I am sure he died a satisfied man, sans regret. Posted in Of Books & Literature, Straight From The Heart and tagged Colombia, Gabriel Garcia Marquez, Love in the time of cholera, magical realism, Marquez, One hundred years of solitude, Shai Venkatraman. Bookmark the permalink.